Happy New Years Eve! Whether you're busy preparing for an exciting night of parties or planning on staying in and relaxing, I hope you all enjoy the last night of 2013 and are looking forward to a bright and promising new year! To celebrate another year's end on the blog, it's time for my annual recap of some of my favourite posts published this year! For the last two years, I've counted down the most popular posts according to pageviews plus my own favourite posts, but this year I've decided to do things a bit differently and only share my personal picks for my favourite recipes. 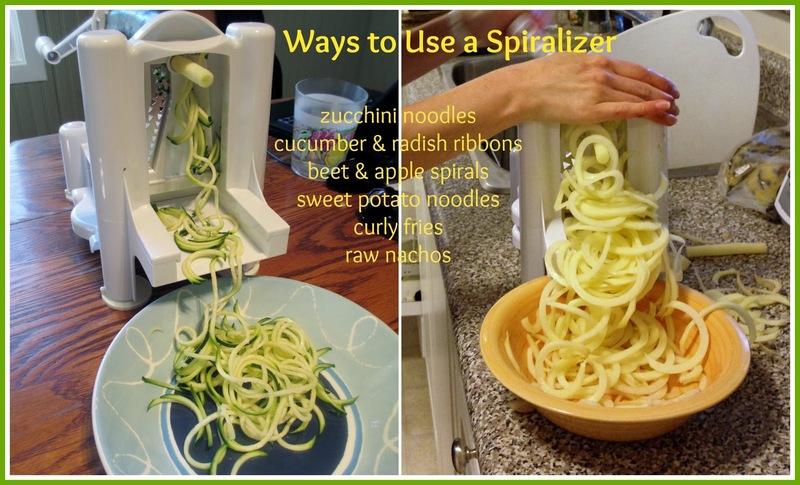 I will note that the most popular post of 2013 by far was my round up of ways to use a spiralizer, and two of the top three google searches leading to my blog this year were for "spiralizer" and "spiralizer recipes". So don't worry, I've taken notice that you guys like seeing new ideas for using a spiralizer tool, and I'll try to post some more spiralizer recipes next year! Without further ado, here are my 10 favourite recipes of the year, organized by category. 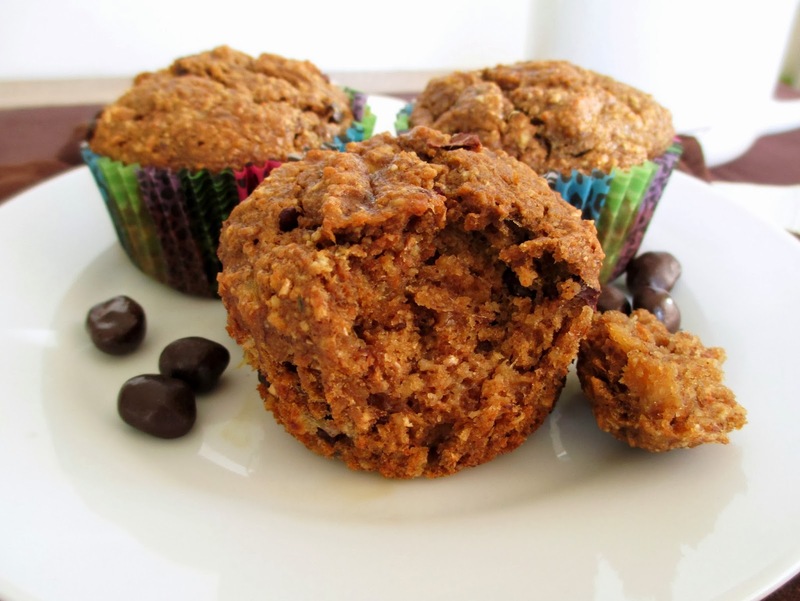 Coffee Banana Muffins - vegan muffins that taste like banana bread but with a dose of coffee flavour and cacao nibs. 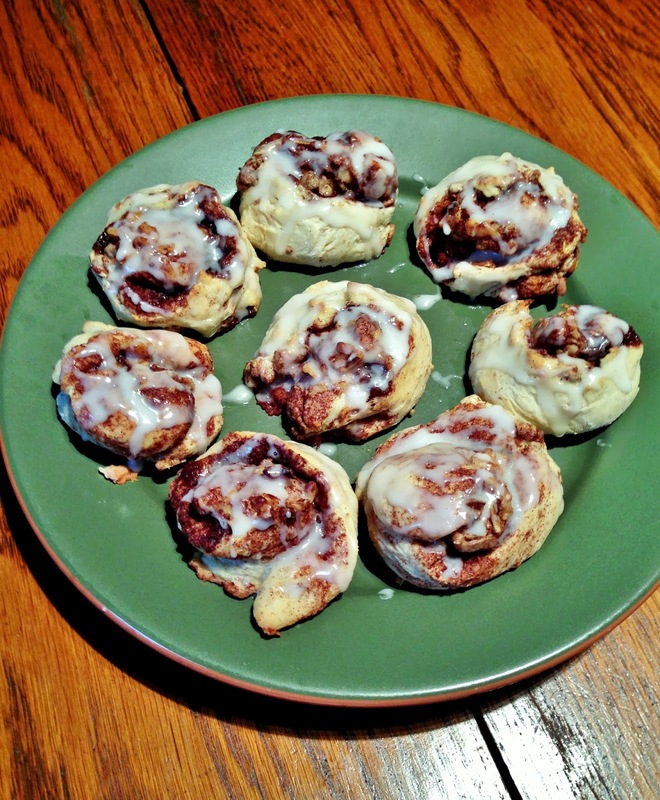 Replacing part of the flour with cereal gave these an even better texture! 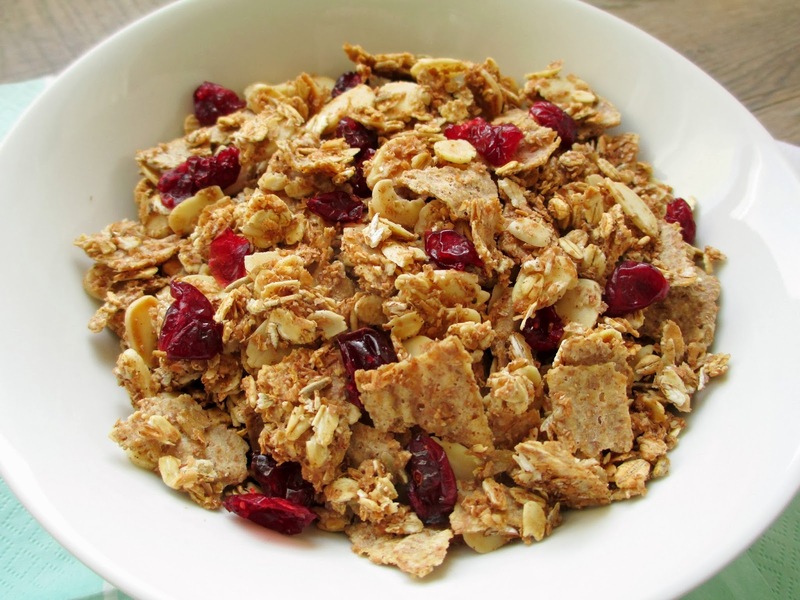 Homemade Bran Flake Cereal - learn how to make your own healthy cereal and customize it how you like it! 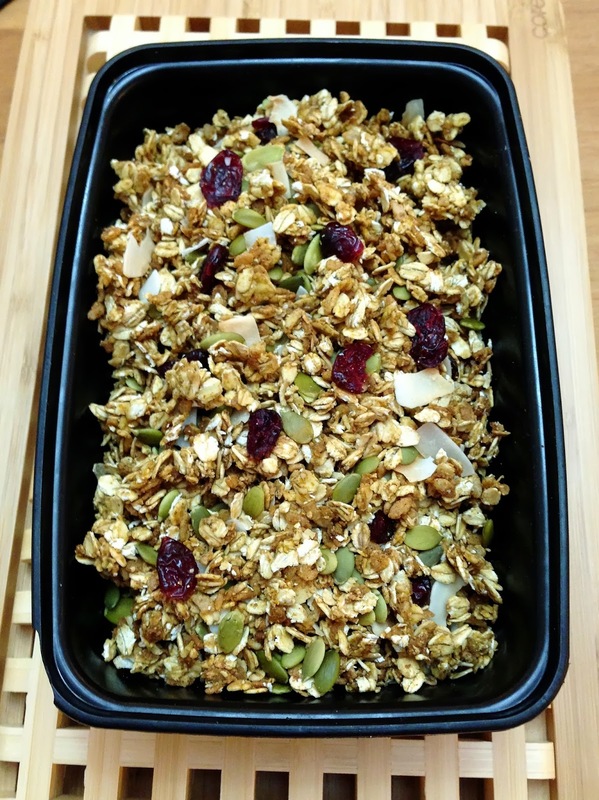 I made mine with a variety of flakes and added cinnamon, cranberries, and almonds. 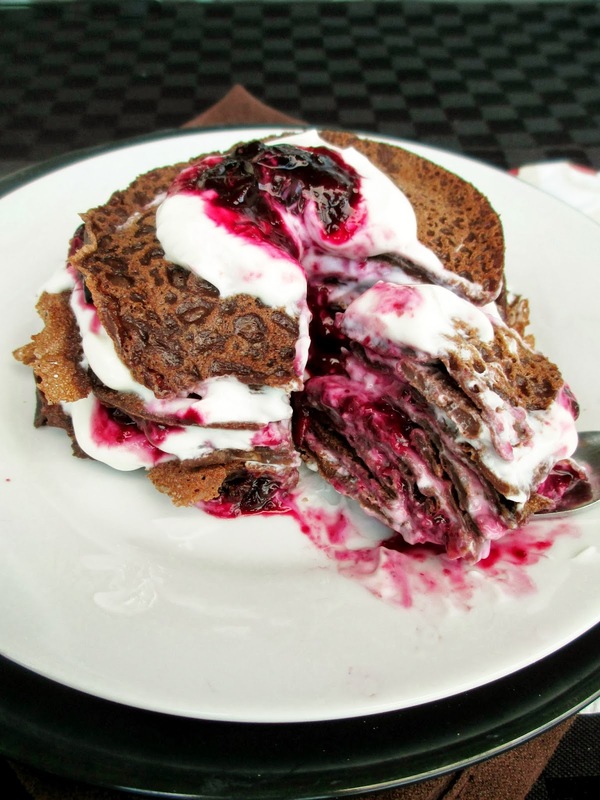 Miniature Chocolate Cherry Crepe Cake - vegan chocolate crepes layered with greek yogurt and a sweet cherry sauce made a delicious and decadent tasting breakfast treat! 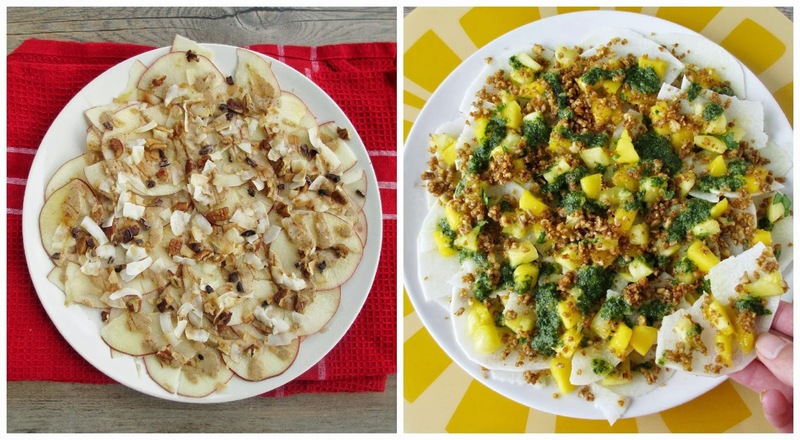 Apple Nachos & Jicama Nachos - I had a lot of fun making two different versions of raw "nachos": thinly sliced apples topped with coconut, peanut butter & cacao nibs; and jicama slices with fruit salsa, raw taco nut crumble and a cilantro sauce. Pumpkin Stuffed Energy Balls - soft and chewy energy balls with a creamy pumpkin hummus filling! 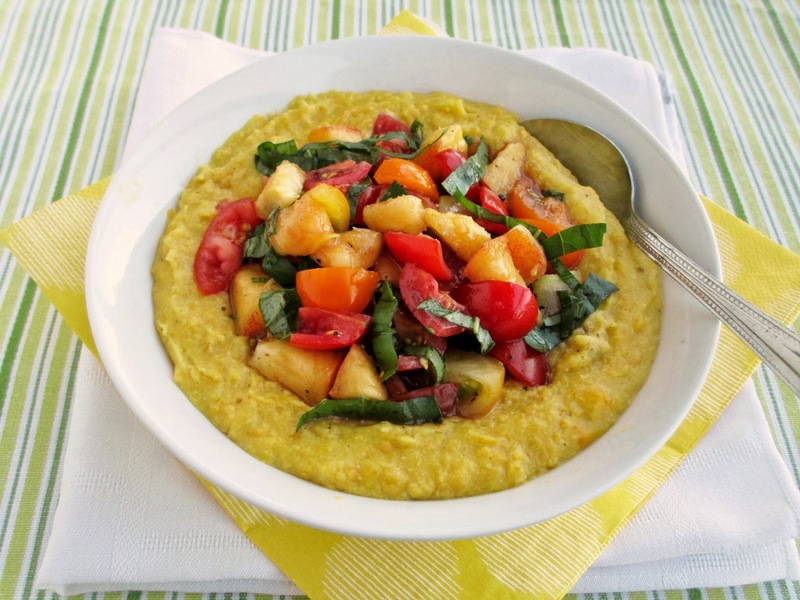 Corn "Polenta" with Peach Tomato Salsa - I love being able to make simple but delicious meals in the summertime using fresh, local ingredients and this was definitely one of those meals! 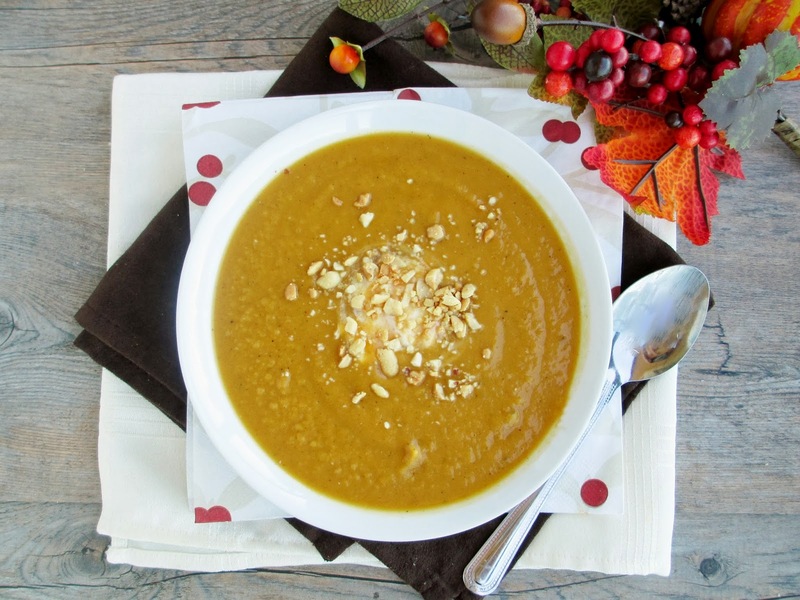 Curried Sweet Potato Apple Peanut Soup - my favourite kinds of soups are thick and creamy dairy-free ones, and I loved this sweet potato and apple version with peanut butter and lots of spices! 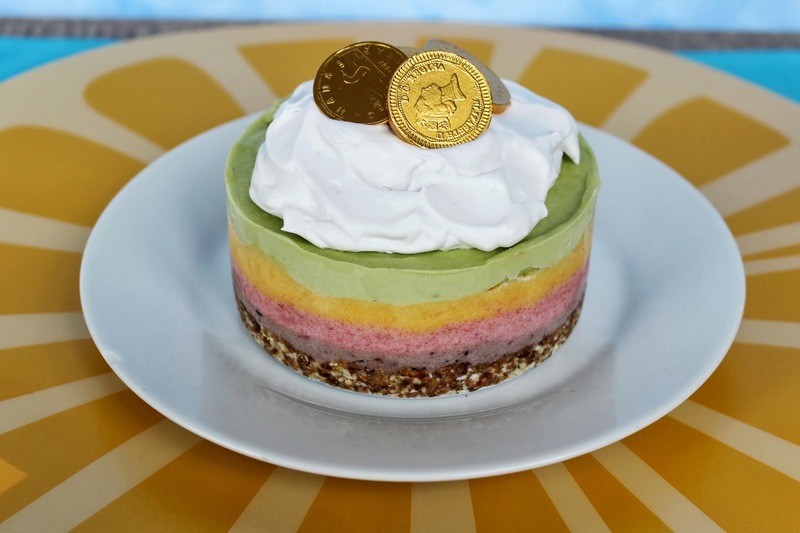 Raw Rainbow "Ice Cream" Cake - If you've been reading this blog for a long time, you've probably noticed that I love to celebrate holidays with food! For St. Patrick's Day this year, I created this frozen rainbow layered cake using different coloured fruits for each layer, with a fluffy coconut milk whipped cream topping. 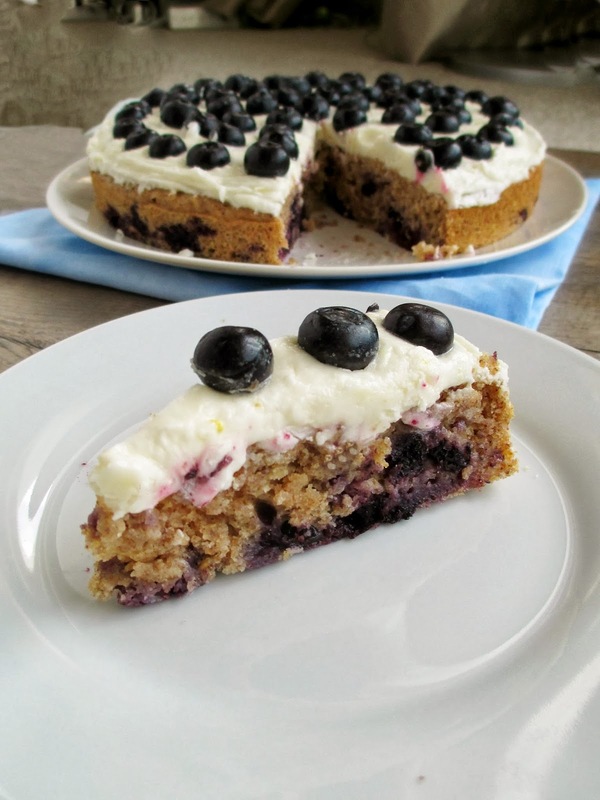 Frosted Blueberry Lemon Cake - this moist vegan cake bursting with blueberries and topped with a sweet lemony frosting was a popular dessert, and I'm sure I'll be making it again next year! 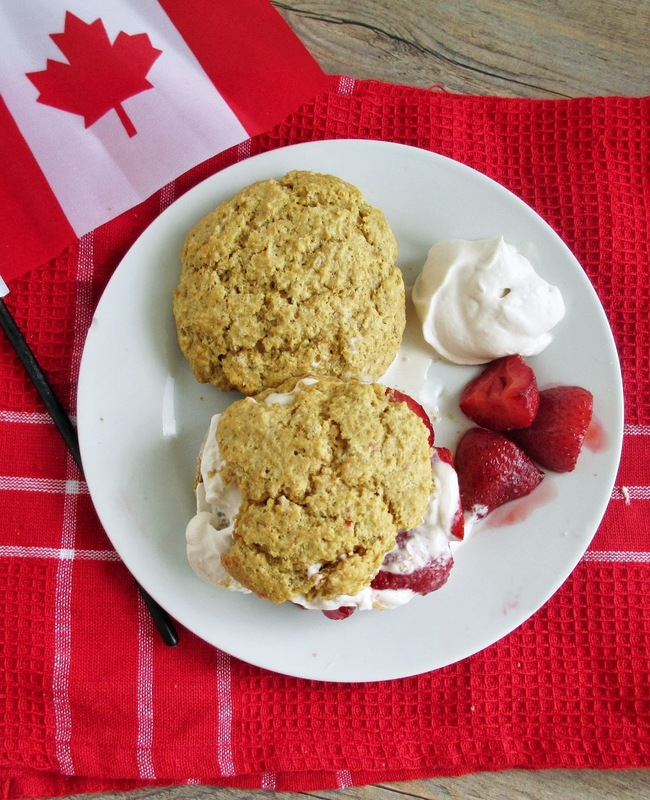 Maple Strawberry Shortcakes with Coconut Whipped Cream - To celebrate Canada Day, I made these crumbly shortcakes with coconut oil and a touch of maple flavour, topped with maple roasted strawberries and coconut milk whipped cream - a healthier version of one of my all-time favourite desserts! Here's to a wonderful and prosperous new year, filled with lots of food and new recipes to share! I can't believe how quickly the month of December has gone by! I thought I would have tons of time to listen to holiday tunes, come up with some festive recipes, and get all of my Christmas preparations done, but Christmas Day is already less than a week away and I feel like I haven't accomplished nearly as much as I wanted to! At least one thing I can say I've accomplished is my shopping - as of yesterday, I'm all finished! Now all that's left to do is is wrap my gifts, which isn't exactly my forte but I actually look forward to doing it every year. As for cooking and baking, I admit I've fallen behind this year with only two holiday themed recipes to share with you so far. First were my gingerbread rye scones, and today I have an even easier no-bake treat for you! I love roasted chestnuts, but it's a bit of a pain to roast them and pry the shells off. So when I saw bags of pre-roasted chestnuts at the store, I thought I would give them a try and see how they compare. As it turned out, they were much tastier than I thought and couldn't be simpler - you can eat them straight out of the package or heat them up for a warm treat. Instead of just gobbling them up, I wanted to use my chestnuts in some kind of snack and my first thought were energy balls. 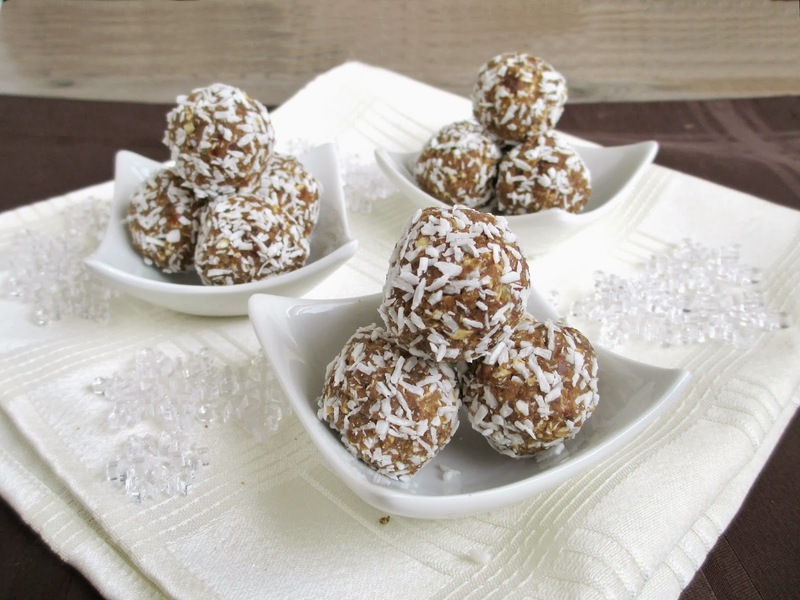 I took my basic formula of energy balls but replaced the nuts with chestnuts and added some flavours like cinnamon, maple and vanilla to complement them. Since the chestnuts were so buttery, they broke down easily in the food processor to create the smoothest "energy balls" I've ever made! These were nice and sweet too, so they tasted more like a dessert even though they're still pretty healthy. 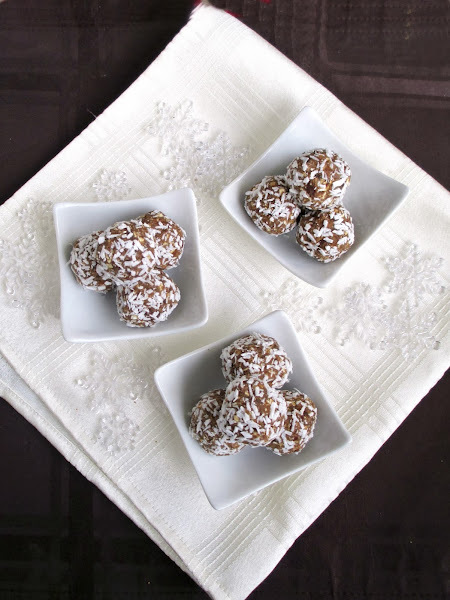 These would make a unique addition to your holiday dessert platters this year, or just to have around as a snack to fuel you through the rest of your holiday preparations! Place the chestnuts, dates, and oats in the small bowl of a food processor and process until everything is broken down. Add cinnamon, salt, vanilla, and maple syrup and process again until the mixture forms a sticky dough. Roll mixture into bite-sized balls. 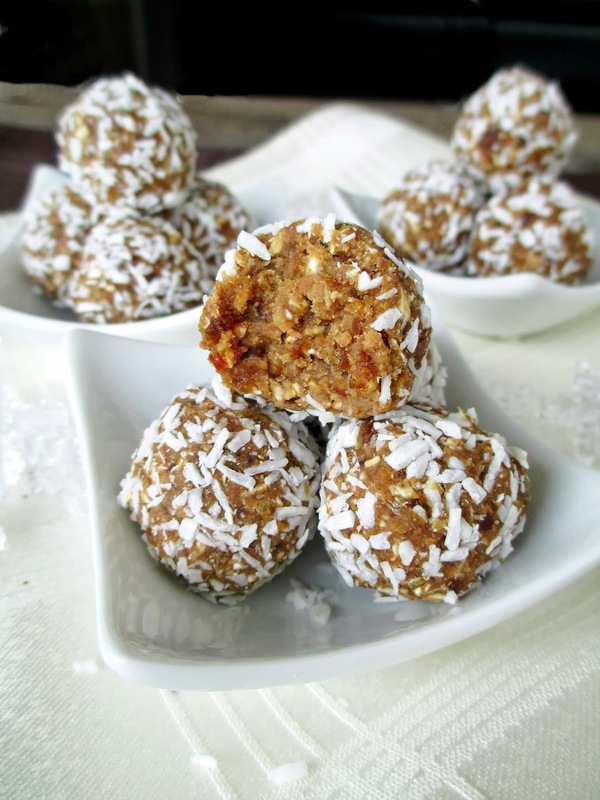 Sprinkle the coconut onto a plate and roll balls in the coconut, using your hands to help press it in. Whenever I buy a package of tofu, I end up having such a tough time deciding what to make with it - not because I don't know what to do with it, but because I have too many ideas and I can't decide! Do I make soba noodles with tofu in a peanut sauce? 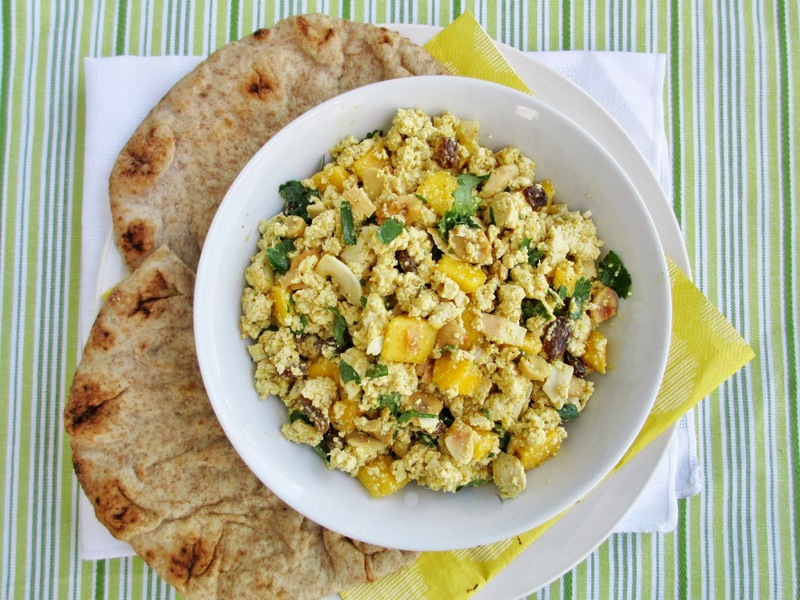 Or crumble it up to make either scrambled tofu or tofu salad? Or maybe add it to a warm soup or curry? One idea that I've been meaning to try for a while and finally got around to doing has been BBQ tofu. I love BBQ sauce and sometimes spend a while looking at all the delicious flavours of it in the grocery store, but I rarely buy it because I end up deciding I don't have much use for it other than as a pizza sauce (which I highly recommend!). Of course, that was silly thinking on my part - there's no reason vegetarians and vegans should be deprived of BBQ sauce when it goes so well with tofu! For my first BBQ tofu attempt, I kept things as simple as possible by using bottled sauce instead of making my own, and a premade coleslaw mix with just a splash of apple cider vinegar and a pinch of salt and sugar for seasoning. The tofu itself is pressed and then tossed in a generous amount of BBQ sauce, then baked in the oven to soak up the sauce and get nice and chewy. I also took some inspiration from this BBQ tempeh and sweet potato recipe from Appetite for Reduction and added some sweet potato to the tofu mix before roasting it all in the oven. After roasting, the tofu and sweet potato really absorbed the sauce so they had lots of flavour. Rather than eating them on their own though, I placed a layer in a tortilla shell topped with the coleslaw mix and an extra serving of BBQ sauce to make a giant soft taco. 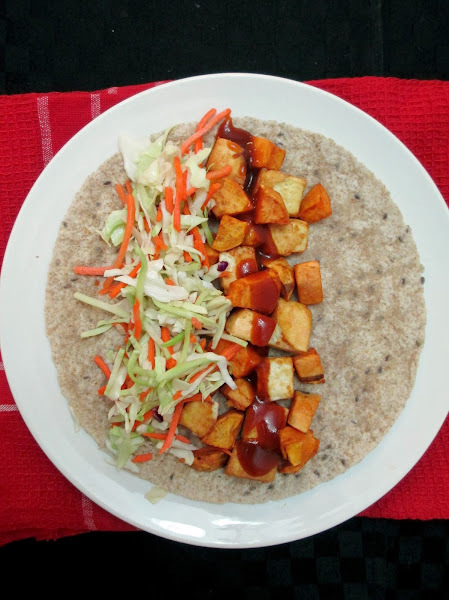 Or if you don't feel like making wraps, you could also eat this as a salad by topping the coleslaw with a serving of the tofu-sweet potato mixture and a drizzle of BBQ sauce - I liked mine both ways! Remove tofu from package, drain, and slice into three lengthwise slabs. Press tofu between paper towels under a heavy book for 15-30 minutes (see this post by Oh My Veggies on how to press tofu if you need a guide). Preheat oven to 400°F and prepare a large baking sheet by lining with aluminum foil and spraying with cooking spray. Slice the tofu into cubes. Toss tofu and diced sweet potato in the ½ cup of BBQ sauce and spread out into a single layer on the baking sheet. Roast in the preheated oven for 20 minutes, then flip or toss the pieces and return to the oven for another 15-20 minutes, until the sweet potatoes are tender. 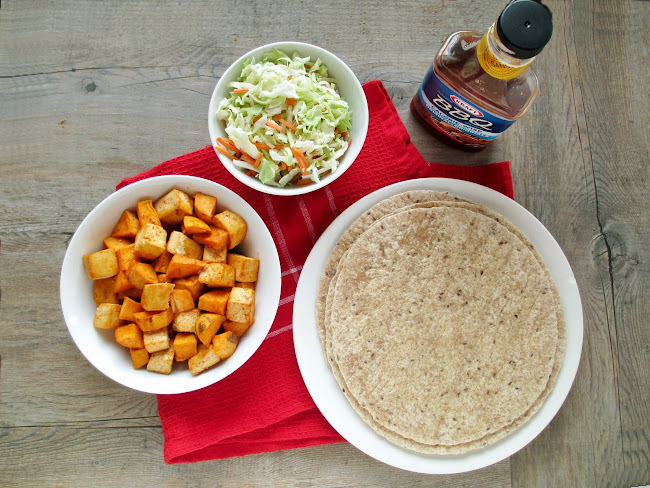 To assemble each taco, warm a tortilla in the microwave (or oven). 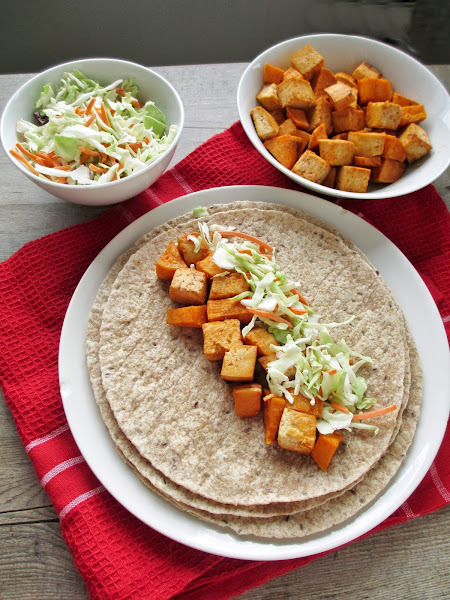 Lay as much of the tofu and sweet potato as you like in a line down the middle of the tortilla. Top with extra BBQ sauce (as much as desired). For each taco, take about 1 cup of coleslaw mix and toss with a splash of apple cider vinegar and a sprinkle of sugar, salt, and pepper. Lay the seasoned coleslaw on top of the BBQ mixture. Close wrap. (Alternatively, place the seasoned coleslaw in a bowl, add a serving of the tofu and sweet potatoes, and drizzle with extra BBQ sauce to make a salad). For my first post of December, I thought it would only be appropriate to share a holiday recipe! As I'm sure you've all noticed, as soon as American Thanksgiving was over last week, bloggers couldn't wait to get into the Christmas spirit, and I'm definitely one of those bloggers! My holiday baking started last week with our annual cookie swap at school, and even though I had just gotten back from a conference and didn't have much time to prepare for it, I couldn't miss the opportunity to try out a Christmas cookie recipe - and to sample everyone else's Christmas baking! I brought these cranberry apple crumble squares from Sweet Twist of Blogging, and I loved how they turned out! And for the record, I think it was our best cookie swap yet, everyone's treats were so good (as evidenced by the rate at which my stash disappeared afterwards)! 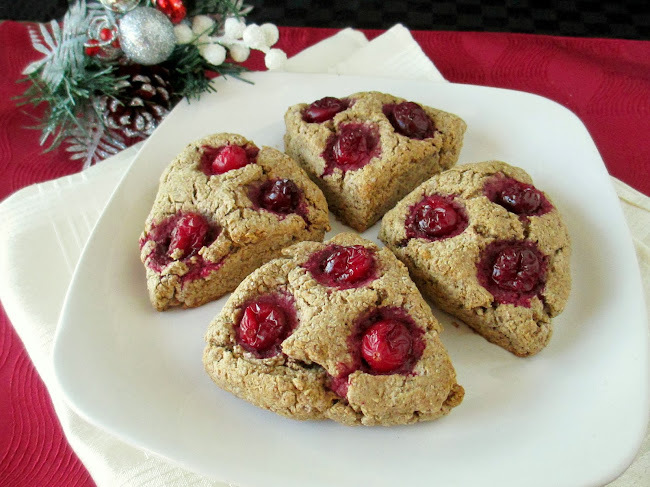 My second holiday themed treat so far this year were these gingerbread scones. These aren't your average fluffy white scones, since they're made with a mix of whole wheat and rye flour and use coconut oil instead of butter. I liked how the darker flours gave the scones a bit of a deeper flavour though and complemented the gingerbread notes well too. Lightly sweetened with a bit of maple syrup and molasses and spiced with both ground and fresh ginger, these scones have a subtle kick to them. You could leave them plain to highlight the gingerbread, or you could add a few whole cranberries to each scone like I did to double up on the Christmassy flavours! Hopefully I'll have more treats to share with you in the next few weeks! In a large bowl, whisk together the dry ingredients (flours to salt). Add the coconut oil and use a fork or a pastry cutter to cut the coconut oil into the dry ingredients until it is fully broken down and the dry ingredients are crumbly. In a separate bowl, mix the almond milk, maple syrup, molasses, vinegar, ginger, and vanilla. If your molasses is really thick, you can blend the ingredients in a blender until smooth (I used this method). Pour the wet ingredients into the dry ingredients and stir just until the dry ingredients are incorporated. Transfer mixture to a clean surface and pat it into a thick round circle. Cut into four equal wedges. 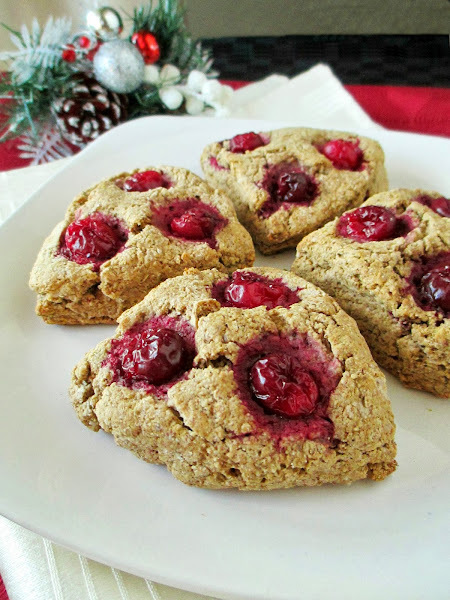 Press a few cranberries into the tops of each scone if desired. Place scones on the prepared baking sheet and bake in the preheated oven for 17-20 minutes, until they are browned on the bottom and firm on top. Let cool on a wire rack. Best served warm, spread with a bit of margarine or vegan butter. Makes 4 small scones (recipe can be doubled for a larger batch - just cut the dough circle into 8 wedges instead of 4). It's been a while since I've posted a round up of recipes I've tried from other blogs - other than all the pumpkin recipes that I've enjoyed this year! My meals lately have definitely transitioned from fresh and light salads to warm and comforting bowls of roasted veggies and hearty soups and stews. 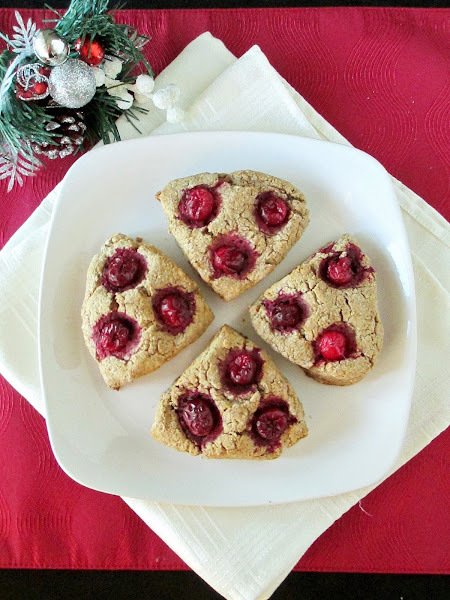 I've also tried out a few vegan cookie recipes recently that I wanted to share with you too! I've made this dish a couple of times in the past and it's just as good every time I go back to it. 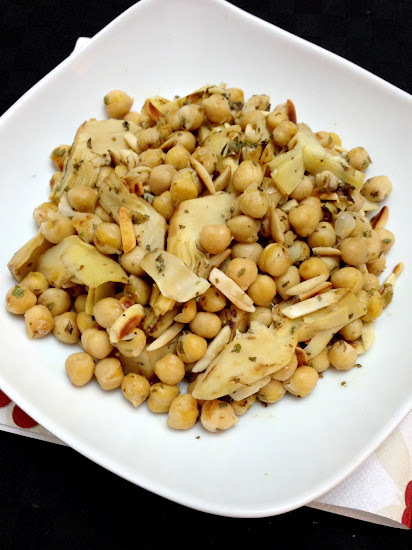 All you need is some canned artichokes and chickpeas, slivered almonds, and some flavourings in the form of garlic, lemon juice, and dried herbs. It seems like a simple combination, but when you eat everything together warm, it tastes a lot more special! Sometimes all I want for dinner is a bowl of veggies, but to make it a bit more dinner-worthy, I'll whip up some kind of sauce to pour over top - usually with tahini and lemon juice. I didn't follow this recipe exactly, but this is the kind of creamy-yet-still-healthy sauce that I think goes perfectly over roasted veggies. To save more time, you can steam the veggies like I did, and use leftover quinoa or even leave out the quinoa. 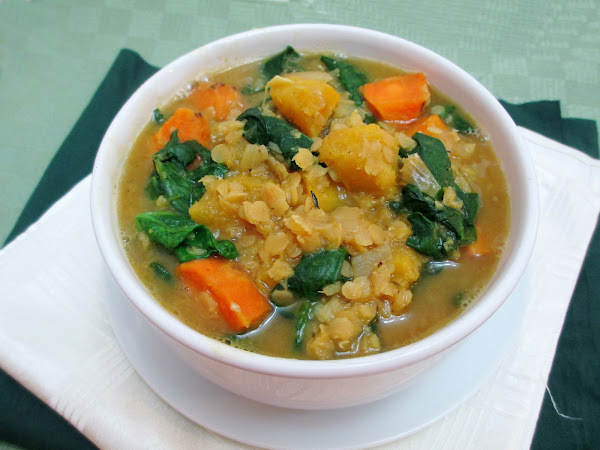 When I thought I might be coming down with the flu last week, I made this healthy stew that had lots of nutritious ingredients in it: garlic, ginger, onion, squash, sweet potato (which I added because I didn't have enough squash), red lentils, and spinach. I even added extra spinach (I used a whole bunch rather than 1 cup) because it cooks down a lot. This was just what I was craving, and while I'm not making any claims as to the powers of this stew, I did manage to fight off any sickness! Another easy stew that I tried recently was a variation on this african peanut stew, which I made for my parents the last time I visited. I love anything with peanut butter and spices so I knew I would like it, but I wasn't sure if my parents would. Turned out I was wrong - they both raved about it! 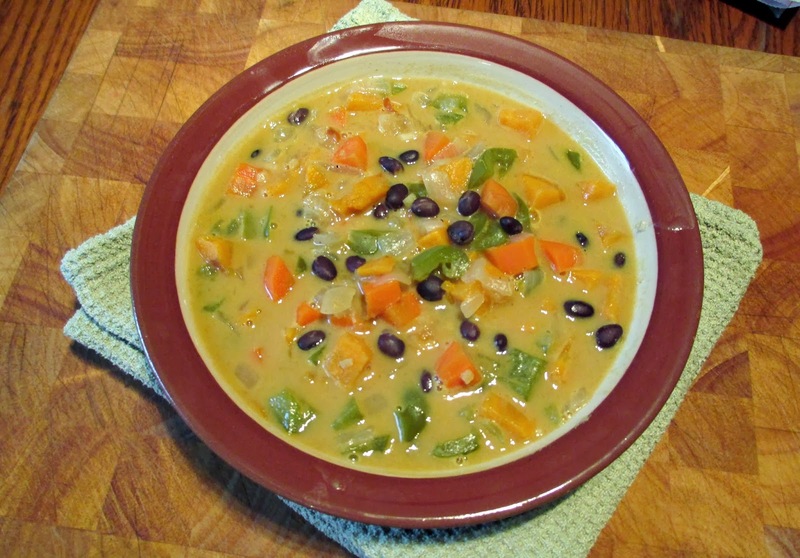 The only changes I made were to replace the chicken broth with vegetable broth and I added a hot pepper and some black beans to make it a bit more filling. 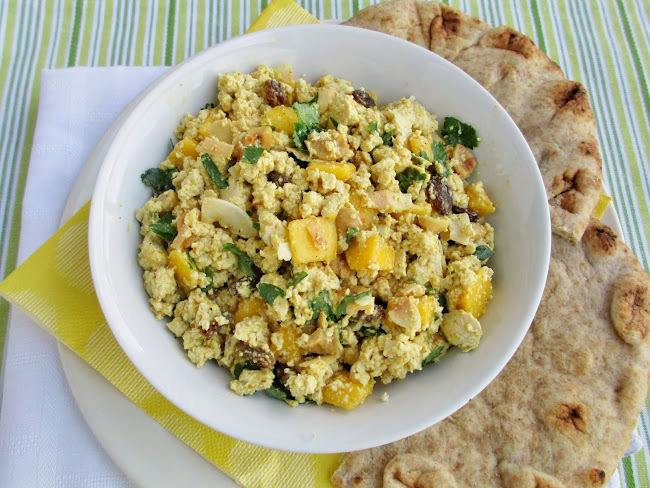 I liked it just on its own, but it would also work well over rice or couscous! Out of all the recipes in this post, these were probably the least healthy, but I made them as a treat for a special occasion (my mom's birthday). I was looking for a no-yeast cinnamon roll recipe because I didn't have a lot of time in the morning, and these were perfect. Plus they were a nice small size so we could still eat a couple for breakfast and not be too full for lunch later! While they weren't quite as tasty as the yeast kind, I thought they were a really close substitution, especially fresh from the oven! I may have posted these cookies before because this is the second time I've made them, but I can't resist a healthy cookie with the combination of banana, peanut butter, and chocolate chips! These are super easy to make and you probably already have all of the ingredients in your kitchen, so you can whip them up anytime as a snack! I've recently discovered Katy's blog and I'm constantly bookmarking or pinning her recipes to try! 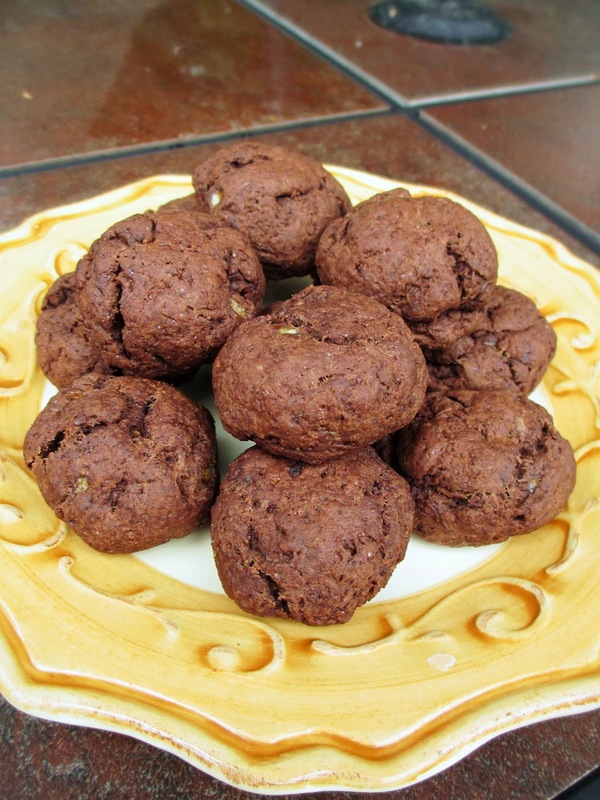 These cookies are pretty healthy and had the perfect balance of banana and chocolate flavours. I also liked that they were nice and soft and fluffy - my favourite kind of cookie! 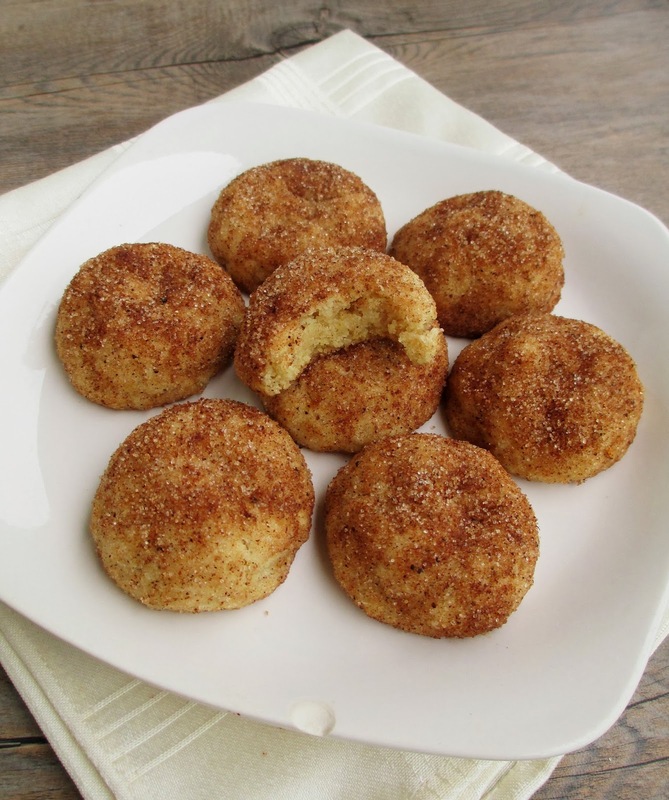 Another healthier cookie that didn't taste "healthy" were these snickerdoodles. I loved the texture - pillowy and soft inside with a bit of crunch on the outside from the sugar, and they're a nice small size so you can eat lots of them! I changed up the spices a bit, adding some chai spices to the coating for a bit of a twist on the usual cinnamon-sugar combo. I might consider adding these to my holiday baking wish list, or if you have any other good cookie recipe recommendations that I could make for our annual cookie swap next week, feel free to let me know in the comments! It's been awhile since I've made my own granola bars as I've been taking the more convenient route of buying them from the grocery store instead. Lately I've been enjoying Kashi chewy granola bars in my favourite flavour: cherry and dark chocolate. 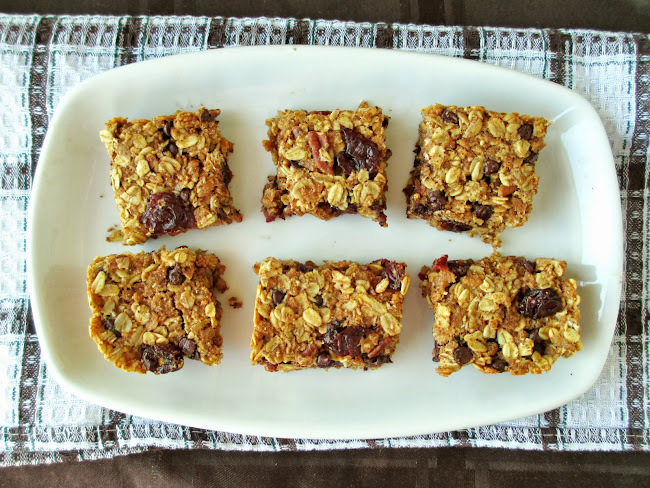 I love the combination of dried cherries with chocolate chips in a granola bar because it makes a healthy snack taste a bit more decadent! Since that brand can be a bit expensive if they're not on sale though, I wanted to make my own version of a granola bar with those same flavours. 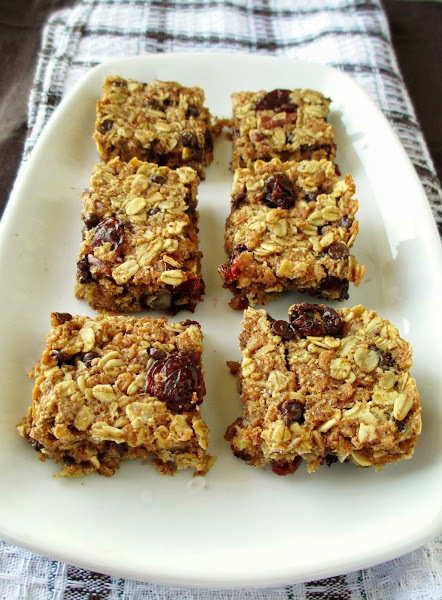 I turned to the blog Healthy Food for Living for my recipe inspiration because I've tried her granola bars in the past and loved them. I only made a few minor changes, swapping almond butter for the peanut butter, changing some of the ingredient amounts, and adding some chopped pecans. I also followed her suggestion of baking them in a loaf pan to get thicker bars. 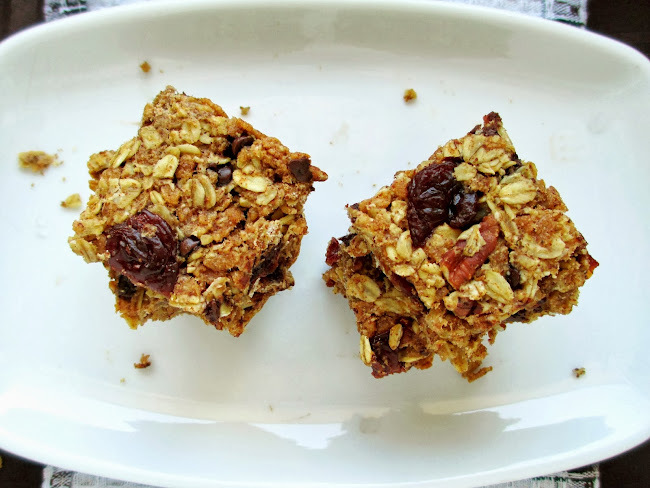 These came out soft and chewy, with lots of flavour - just how I like my granola bars! I also liked that they were plenty sweet for my tastes with only a bit of extra sweetener (in the form of pure maple syrup) because the tart cherries added some sweetness of their own. These make a tasty and hearty snack that you can cut into whatever size you want - smaller squares or longer granola bars. I can't say that I'll stop buying Kashi or other granola bars, but it's nice to have a homemade snack around once in a while too! Preheat oven to 350°F. Line a 9x5” loaf pan with parchment paper and spray lightly with cooking spray. In a medium sized bowl, stir together the applesauce, maple syrup, and almond butter until smooth. Stir in the vanilla extract. Gently fold in the remaining ingredients until everything is evenly coated. Pour into prepared pan, smoothing out the top with a rubber spatula. Use your hands or the spatula to press down firmly on the top so that the mixture holds together tightly. Bake in the preheated oven for 25-30 minutes, until lightly browned and firm on top. Cool in the pan for 10 minutes, then carefully remove from the pan and let cool completely on a wire rack. Cut into bars or squares. Now that we've had our first official snowfall of the year (as in, the snow actually stays on the ground and doesn't just melt away immediately), I think it's appropriate to share a holiday recipe on the blog! This recipe can actually be made any time, it's not just for the holidays - I just think it looks so festive with the green, red, and gold colours in it, and it tastes Christmassy too! 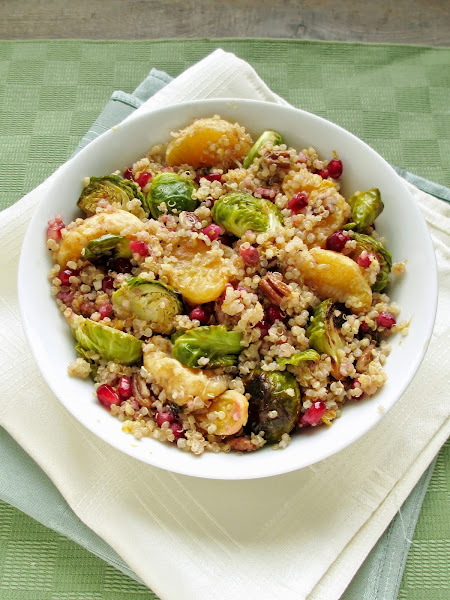 I saw this recipe for roasted brussels sprouts, clementines, and pomegranate on Edible Perspective and thought it would make a great quinoa dish. It may sound like an odd combination of ingredients at first, but when everything is tossed together in a citrusy dressing with crunchy pecans, it works! Roasted brussels sprouts are my favourite way to eat them, and if you've never tried roasting citrus fruit, this is a great way to try it out too! The slightly charred clementine segments come out of the oven soft and warm and bursting with juice. Plus, you don't have to worry about any pesky seeds with clementines! The pomegranate arils add lots of crunch to the mix along with the toasted nuts, and I loved the sweet and tangy clementine dressing with a bit of a kick from some garlic and ginger. I think this could make a nice side dish to keep in mind for your holiday meal planning over the next month or two! Preheat oven to 450°F and prepare a large baking sheet by lining with tin foil. 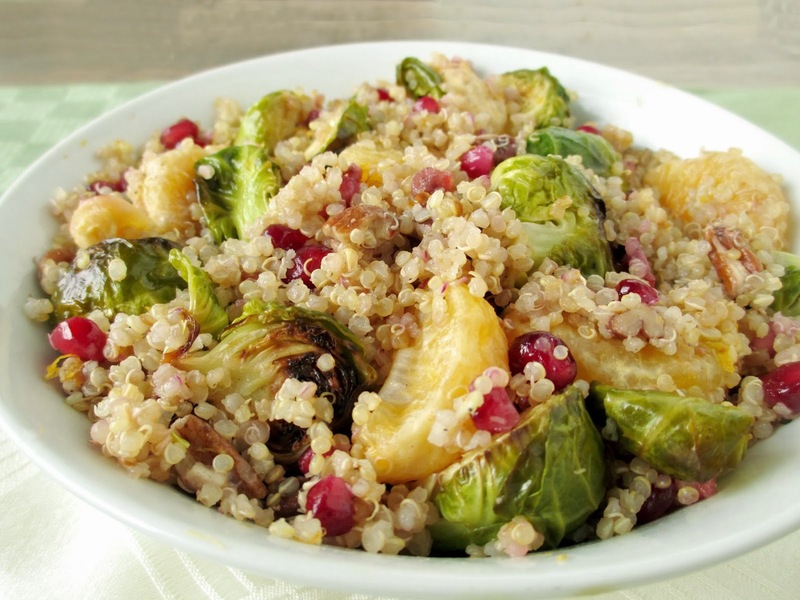 Wash the brussels sprouts and trim off the bottoms and outer leaves. Slice in half (or quarters for larger ones) and toss with the olive oil, some salt and pepper. Peel the clementines (tip: before peeling, remove enough zest for the dressing) and separate each one into four or five sections. 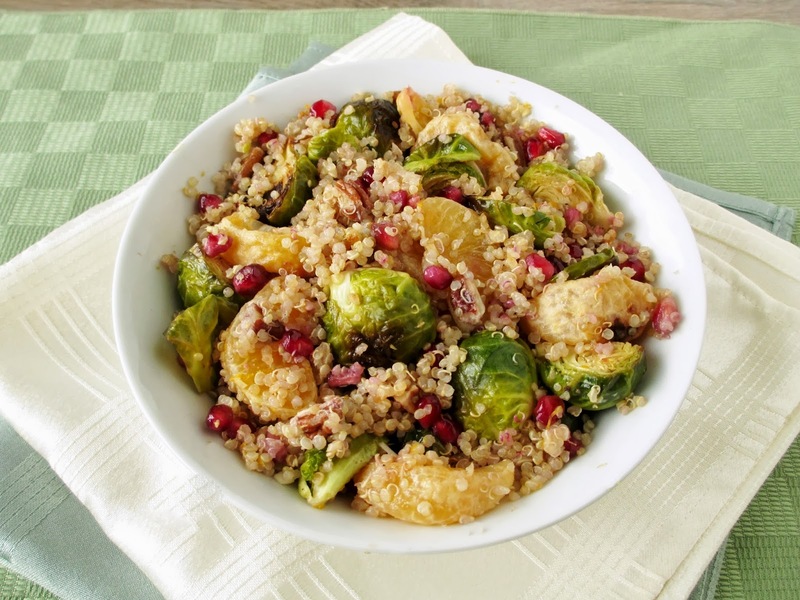 Toss clementine pieces with the brussels sprouts, then spread everything out onto the prepared baking sheet. Roast for 20-25 minutes, until the brussels sprouts are browned. Remove from oven. When cool enough to handle, separate the clementine chunks into single pieces. Meanwhile, bring 2 cups of water to a boil in a medium sized saucepan. Add the quinoa, reduce heat to medium-low, cover, and simmer for about 15 minutes (or according to package directions). Remove from heat and let sit covered for 5 minutes, then fluff with a fork. Heat a small skillet over medium heat and toast the pecan pieces for a few minutes, until lightly toasted and fragrant. Remove from heat and transfer to a small bowl. Prepare the dressing by whisking together all ingredients in a small bowl. Transfer quinoa to a large bowl and add the roasted brussels sprouts and clementines. Add the toasted pecans and pomegranate arils. Toss to combine. Pour over the dressing and toss well to mix. Season with additional salt and pepper if desired. I got a late start to my pumpkin baking this year, but once I opened my first can, I made sure to squeeze in as many pumpkin goodies as I could! I've heard people say before that they're going to turn into a pumpkin from eating too much of it, and now I understand how they feel...Not that I'm complaining - personally, I can't get enough of anything and everything pumpkin this year! And instead of keeping all the goodies I've tried to myself, I thought I would post a round-up of the pumpkin recipes I've tried this season, similar to last year's post. Most of them were adapted from other blogs, so be sure to check out their sites too! With all of the pumpkin recipes that I bookmark, there's never a shortage of ideas from other bloggers that I want to try. 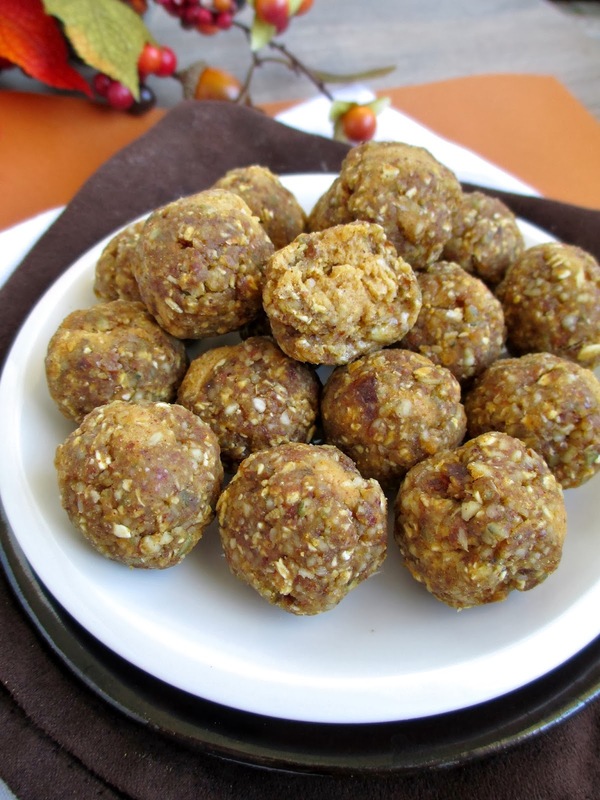 But the one pumpkin recipe of my own from this year were these pumpkin stuffed energy balls. 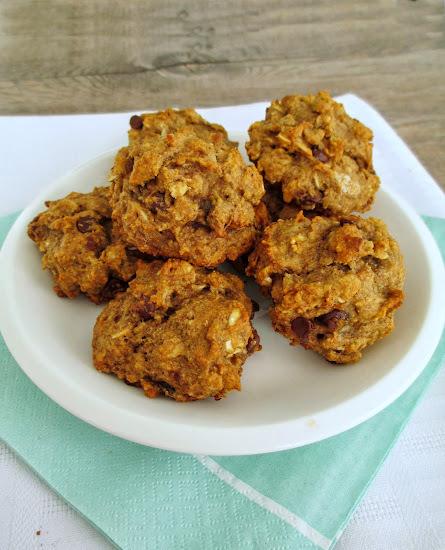 With the "dough" made from raw nuts and dates, and a filling of pumpkin hummus, these made a healthy and tasty snack! 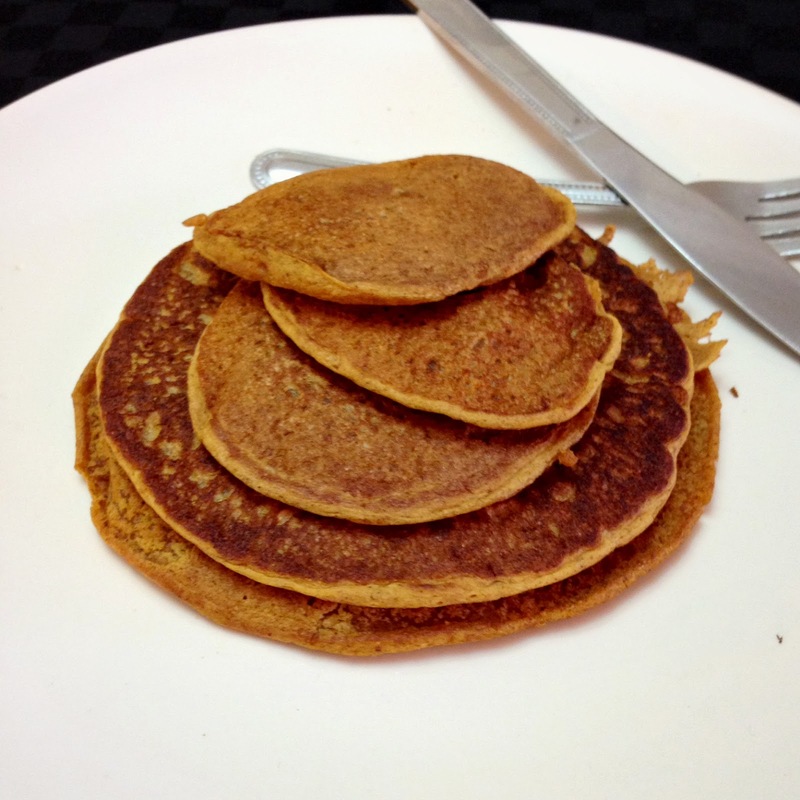 For breakfast a couple of weekends ago, I used some of my leftover pumpkin puree to make these vegan pumpkin pancakes from Daily Garnish. They turned out a bit thinner than my usual pancakes and took a while to make with my limited set of skillets (which is why I started making mini ones, seen on top in the photo), but they were worth the wait! They had a nice amount of pumpkin flavour and the pancakes themselves weren't very sweet, making them the perfect base for lots of maple syrup! When I'm in the mood for a cold drink in the morning instead of hot coffee, I like to add instant coffee to a smoothie. 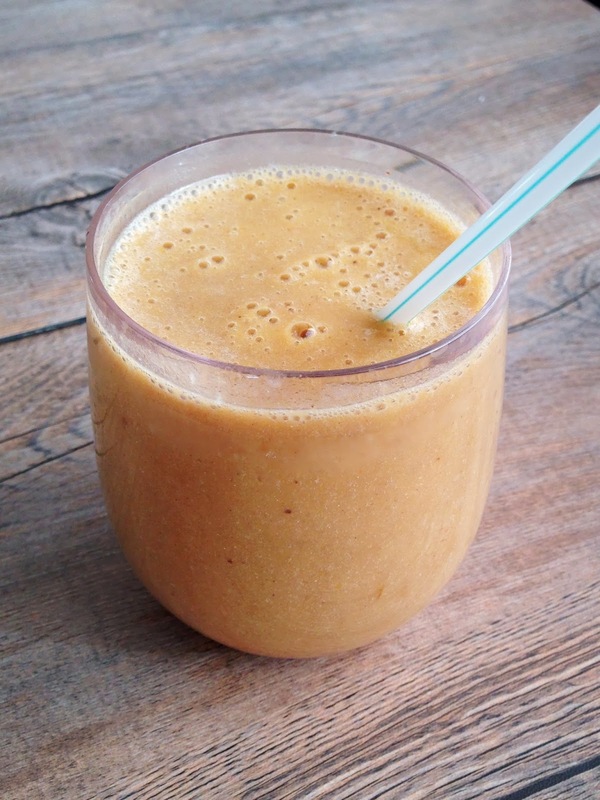 This smoothie also had pumpkin puree and pumpkin spice to make it more appropriate for fall. I didn't really measure ingredients this time, but you can check out this post from last year for a recipe. One of my favourite pumpkin recipes that I've tried so far this year was this pumpkin banana breakfast cake from The Pancake Princess. 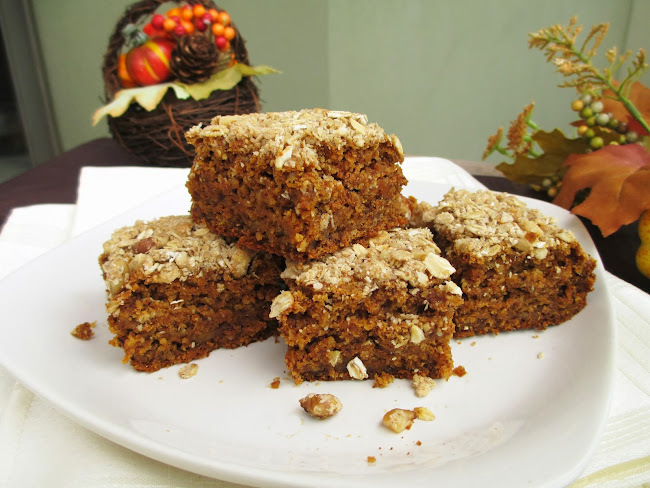 The only changes I made were to use coconut oil instead of olive oil, chopped walnuts in the topping instead of ground, and I replaced the spices in the cake with 1.5 tsp pumpkin pie spice. I loved the texture of the cake, and I liked that it tasted light and not too sweet, so that you could eat it as a relatively healthy snack any time of day! 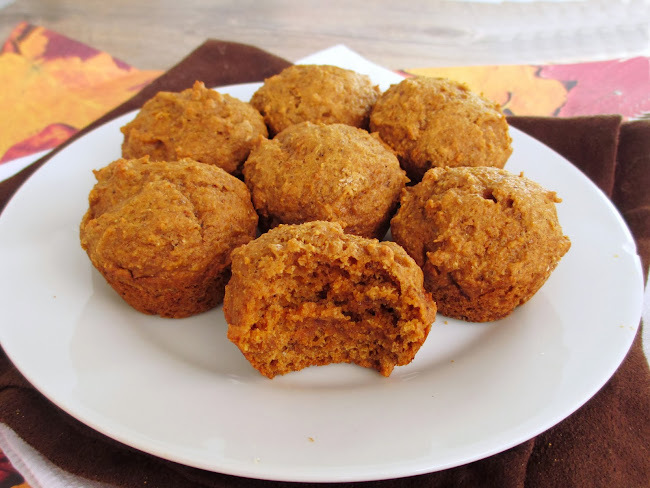 Another healthy baked good that I made with pumpkin were these mini vegan pumpkin muffins from Eating Bird Food. They were nice and fluffy and moist inside, despite having very little oil, and even though they looked a bit plain, I thought they still had lots of flavour! I've had a large bottle of this pumpkin beer sitting in my fridge for awhile, and since it was a relatively strong one, I decided to use some of it in a recipe rather than drinking the whole thing myself! I've been wanting to try making beer bread for awhile too, so when I saw this recipe for pumpkin beer bread on Gimme Some Oven, it was the perfect opportunity! 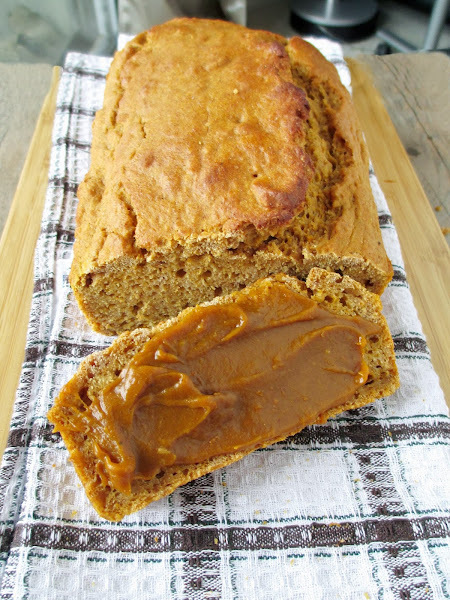 With pumpkin puree, pumpkin spice, and pumpkin beer, this bread had a nice amount of pumpkin flavour, while still being more on the bread side than a sweet breakfast loaf cake. Unfortunately, my bread ended up with an unpleasant bitter aftertaste from using a dark, strong beer, so next time I would make this with a lighter pumpkin beer. To cover up some of the bitter taste, I made a thick, spiced pumpkin butter to spread on it, which was the perfect combination! I only had a small amount of pumpkin puree left in my can, so I roughly followed a couple of recipes that I'd seen for pumpkin butter, just guessing on amounts of spices and sweetener. 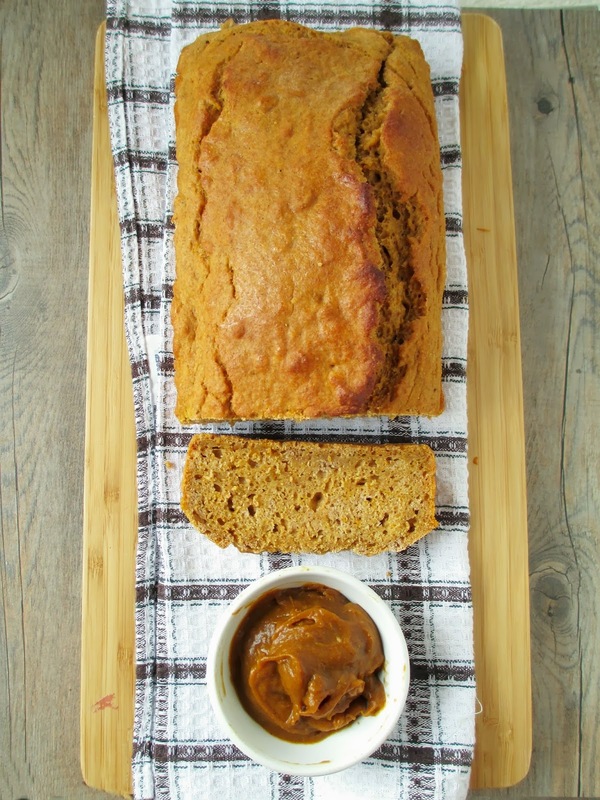 Luckily, pumpkin butter isn't very finicky so it still turned out great! For actual recipes, I would recommend looking at these ones from Oh She Glows and Hidden Fruits and Veggies (I used a less sweetener in mine though). I've made pumpkin granola in the past and remembered loving it, so I wanted to make another batch this year. I followed this recipe from Two Peas and Their Pod, except I left out the brown sugar because I didn't want it to be too sweet, and I added some coconut flakes near the end of the baking time. This was nice and crunchy and it was good for both snacking and eating with yogurt! 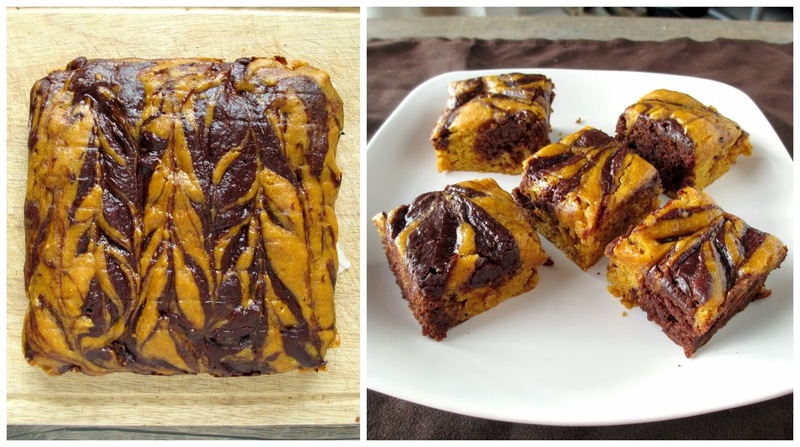 Last but not least were these vegan pumpkin swirl brownies from The Balanced Platter. I'm not usually one for chocolate treats, but these had a good balance of richer chocolate with lighter spiced pumpkin. They turned out more like a snack cake than brownies, and were definitely more on the healthy side than a decadent dessert, but I loved them more for those reasons! I need to work on my swirling skills (and learn not to flip the cake upside down onto a wire rack, leaving lines all over them), but I would definitely make these again! Of course, not all of the pumpkin treats that I've enjoyed this year have come from my own kitchen. 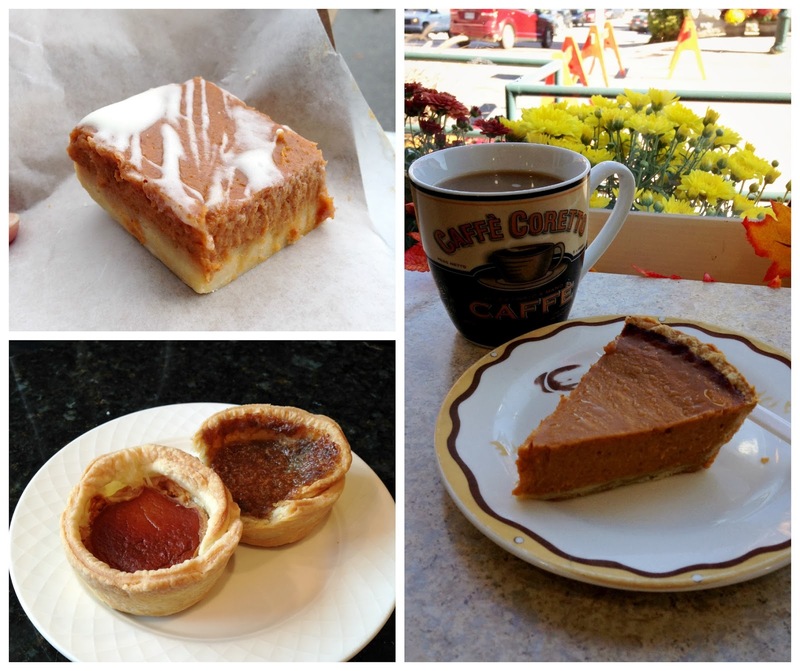 In addition to too many Starbucks' pumpkin spice lattes, my favourite storebought treats recently have been a pumpkin pie square, a pumpkin butter tart, and classic pumpkin pie (all pictured above). Even though it's now November and holiday drinks and treats have made their way into every store and cafe, I still plan on enjoying pumpkin for as long as I can! Things have been a bit busy for me lately, and between schoolwork and weekend trips, I haven't been able to spend as much time blogging as usual (sadly I won't have a new Halloween recipe this year!). I've still been cooking and making recipes, but I've been leaning more towards easy and quick dishes that can be made with minimal ingredients, like this one! This mango curry tofu salad was the perfect meal to have around for lunches last week - with no cooking involved, it can be thrown together pretty quickly, and it will keep in the fridge for a couple of days so you can make it ahead of time and bring the leftovers for lunch. If you've never had tofu salad, it's basically uncooked firm tofu that you crumble up into pieces to resemble egg salad. Whip up a creamy dressing and add in some fruit, veggies, or fresh herbs and you get a refreshing and light lunch that can be eaten on its own or stuffed into a wrap or pita. I usually make a simple tofu salad with apples and a mustard dressing, but this time I changed things up a bit and made an Indian-inspired version. I left out the mayo in the dressing and used yogurt instead, mixed with curry powder and mango chutney for a sweet-and-spicy combo. 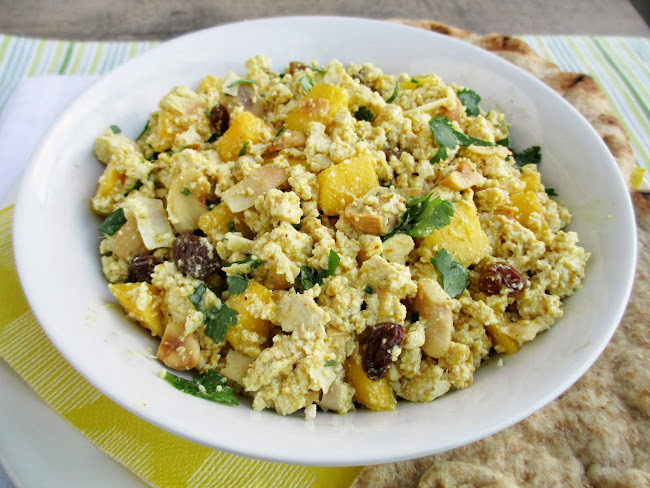 Along with the tofu, I added fresh chopped mango, cilantro, raisins, cashews, and toasted coconut for a mix of textures. The tofu soaked up the dressing to become extra creamy and cool, and I loved the burst of fruitiness from the mango along with the crunchy nuts and chewy coconut. I liked eating this both on its own and inside of a pita, or you could try toasting some naan bread to make naan "chips" and eating it like a dip! Slice the tofu in half and press between layers of paper towel under a heavy book for about 15 minutes to remove some of the water. Crumble the tofu using your hands or a fork into a bowl. Add the mango to the bowl. Heat a small skillet over medium-low heat. Add the coconut flakes and toast just until they start to turn light brown. Immediately remove from pan and add to the tofu mixture. Add the cashews, raisins, and cilantro to the bowl as well and toss to mix everything. In a separate small bowl, stir together the yogurt, mango chutney, curry powder, salt and pepper. Pour this mixture over the tofu salad and stir well to mix. Chill in the fridge until ready to serve. Eat on its own, with naan bread, crackers, or stuffed into pitas. Has anyone experienced their first snowfall of the season yet? I've heard of snow sightings from friends further north in Ontario the past couple of days, so I hope it's not making its way down to southern Ontario - I'm not quite ready for that yet! There's nothing like a hearty dinner to warm you up on cold days like this though, which is why I'm sharing this pasta recipe today! When I eat a bowl of pasta, I like it to have lots of sauce and lots of "extras" in it so that no bite is just plain pasta, and this pasta was just that. I've been wanting to try making a roasted red pepper sauce for quite a while now, and I finally got around to it a couple of weeks ago when I had a lonely red pepper in the fridge that needed to be eaten before it went bad. I used Colourful Palate's recipe for vegan mac & cheese as a guide for the sauce, but turned it into a more smoky and spicy dish by adding some spices to the sauce, roasted broccoli, and Mexican veggie sausage (one of three flavours from Field Roast and the only brand of veggie sausage I've found that I really like!). The sauce was an interesting change from the tomato-based pasta sauces that I'm used to. It had a bit of a chunky texture from the cashews and sunflower seeds, a nice smoky flavour and a hint of cheesiness from the nutritional yeast. This can be a quick and easy dinner if you make the pasta sauce ahead of time like I did, and to save even more time, you could just cook some noodles and toss it with the sauce for a simple meal. 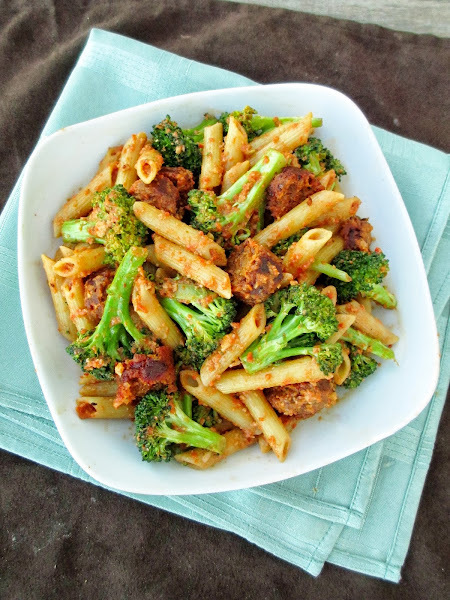 If you like veggies in your pasta like I do though, the roasted broccoli was the perfect addition. 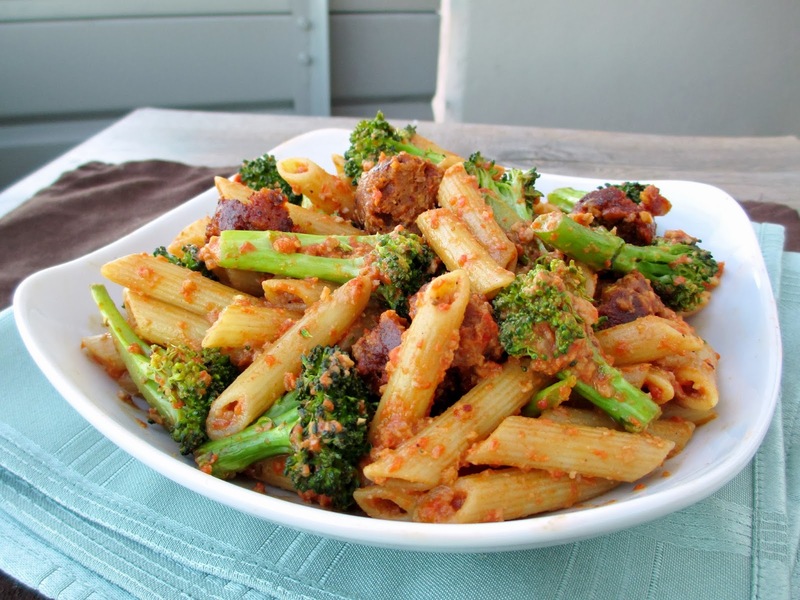 The spicy veggie sausage complemented the flavours in the sauce really well too, while also making it more of a hearty and filling dish - just what I crave to warm my belly on a chilly night! Turn oven on to broil and rub the outside of the red pepper with a bit of oil. When oven is ready, place the whole pepper on a baking sheet and broil for 10-15 minutes, turning occasionally, until it starts to blacken. Remove pepper from oven and place in a bowl of water to help loosen the skin. Peel off as much of the outside layer of skin as you can and discard. Roughly chop the pepper into pieces and remove the seeds. Place the cashews and sunflower seeds in a food processor and process until finely ground. Add the red pepper pieces and the remaining ingredients and puree until as smooth as possible (it may still be a bit chunky from the nuts). Taste and adjust seasoning if desired. Makes about ¾ cup sauce (enough for about 2 servings of pasta). Preheat the oven to 400°F and bring a large pot of salted water to a boil. Toss the broccoli pieces in a bit of olive oil and spread out on a baking sheet. Roast in the preheated oven for 15-20 minutes, until it starts to brown. Meanwhile, add the pasta to the boiling water and cook according to package directions. Drain and place in a large bowl. Heat a small skillet over medium heat and spray the pan with cooking spray. Cook the veggie sausage for about 5 minutes total, turning often, just until it is heated through and browned on all sides. Chop into pieces. Add the broccoli to the pasta and pour the sauce over top. Toss well to mix. 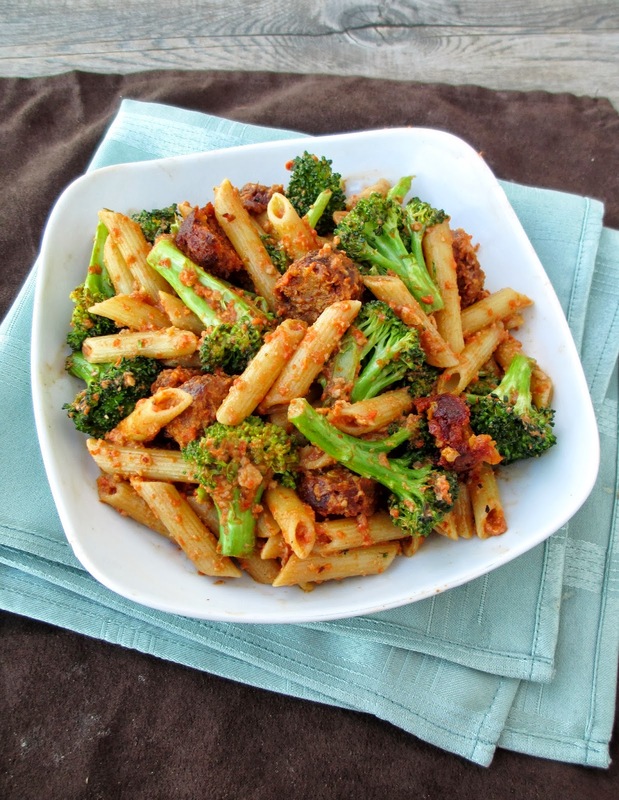 Gently mix in the sausage pieces, or divide the pasta into bowls first and then top with the sausage.